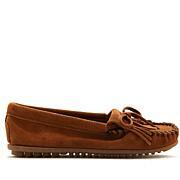 These leather shoes are a sporty spin on Minnetonka's timeless kilty moccasin. 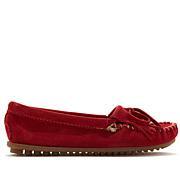 Handmade from soft leather with a natural texture, these shoes are ultra-comfortable. 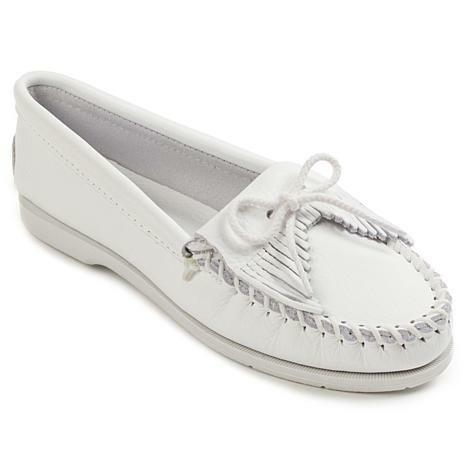 Classic fringe details and cotton laces give it a boat moc style with a twist. A rubber soles keep the perfect grip whether your adventures take you to land or to sea. I purchased both colors in size 11. With boots I wear 11W. The fit is perfect. The colors are pretty. Wish there were more colors too choose from. Very comfortable with or withhout socks. The leather is a good quality. The price is right.5 STARS PLUS.